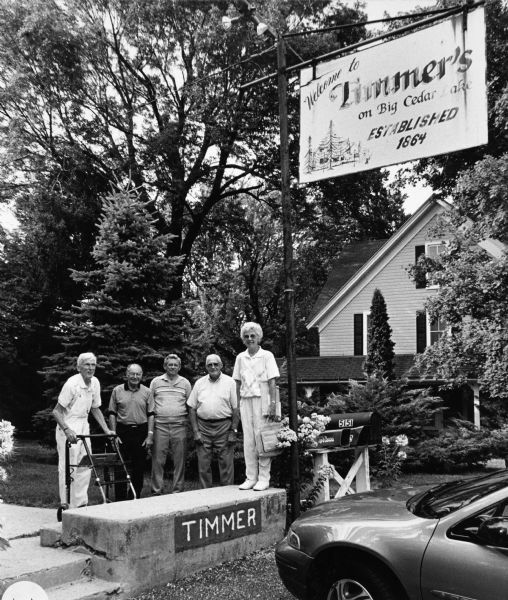 "Timmer's is on the southeast shore of Big Cedar Lake in Washington County. In the past it served as a hotel dating back to 1864." From left to right; Ralph Widmer, Rudy Heinecke, Ralph "Buddy" Ruecker, John Bodden, and Shirley Widmer. Loaned for scanning by Jim Widmer. Part of the series of photographs taken by Jim Widmer of fish fries in Wisconsin. Volume B, Page 1.